How can I talk about Crusaders without discussing the theme? The Crusades are a deeply uncomfortable part of western history and while I’m fairly ignorant about much of that period, the combination of religious zealotry and state power seen there unsettles me. It’s a very dark part of my religion’s history, and any game that takes it on as a theme ought to tread carefully. 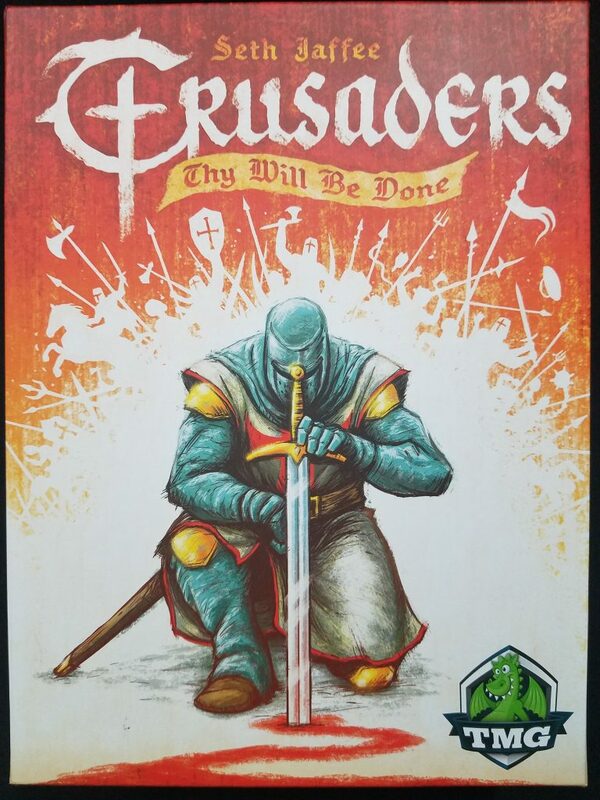 The weird part of Crusaders (subtitled “Thy Will Be Done”–in context, a corruption of the Lord’s prayer) is that not only does it not care much about the darkness in its theme, it doesn’t care much about the theme at all. This is a game about the Crusades as much as Castles of Burgundy is about chateau design. The designer, Seth Jaffee, understands this and notes in the rulebook that the game is “not a history lesson”. It seems he found a part of history that interested him and simply adhered it to a set of mechanisms he was working on. I understand why some people might not like historical games that involve dark periods of history, though I disagree. I think games can be a great way to introduce history to someone or for a designer to develop a point of view about a conflict or event. The reason Crusaders gives me pause, however, is precisely because it doesn’t bother doing any of that. The history of the Knights Templar is just a skin draped over a set of fairly abstract mechanisms. Catan has been criticized by some for a vaguely colonialist look, though I think that’s quite a stretch as it makes no reference at all to anything that actually happened. Some might object to playing as the Nazis in a game like Memoir ‘44, and while people certainly have the right to feel uncomfortable by that, the game is very clearly about military tactics (however abstracted) and it makes a strong effort to stay rooted in historical reality by mapping each of its scenarios to actual battles. Similarly, Here I Stand is about military/religious conflicts, but it’s so dedicated to simulating history that broader critical themes emerge. The mixture of political maneuvering and religious debate is sometimes so absurd as to elicit laughter. “I’ve defeated you in this debate, but I promise not to excommunicate you if you let my troops occupy this area”. The high level strategic point of view that sees land and people as resources to be used is the point. Transporting the players into the POV lets us get a taste of the corrupting perspective of power. How do I dig my way out of this? Is the solution to disengage, to separate myself from what’s scary, complicated, or uncomfortable? Do I engage fervorously, protesting anything and everything with an insatiable anger? The former is death, the latter abandons grace. I won’t lie and say I have some kind of all-encompassing intellectual construct for determining appropriateness, but I do wish Crusaders was themed differently. I’ll still play it at home, but I’d feel a bit odd going to a meetup with people I don’t know well and proposing that we “play Crusaders”. If that game’s not really about the Crusades, what’s it about? In short: rondels. Actually a kind of rondel/mancala blend, elegant yet robust like a fine Bordeaux. Each player has their own action carousel made of six wedges with various actions on them. The options are simple but allow divergent strategies. It’s the kind of game where at some point you’ll need to do a bit of everything, but you’re best served by moderately focusing on a specialty. Whenever you choose an action you’ll take the tokens on that wedge and distribute them one by one clockwise, filling up other action spaces. The number of tokens on the wedge indicate the strength of that action. 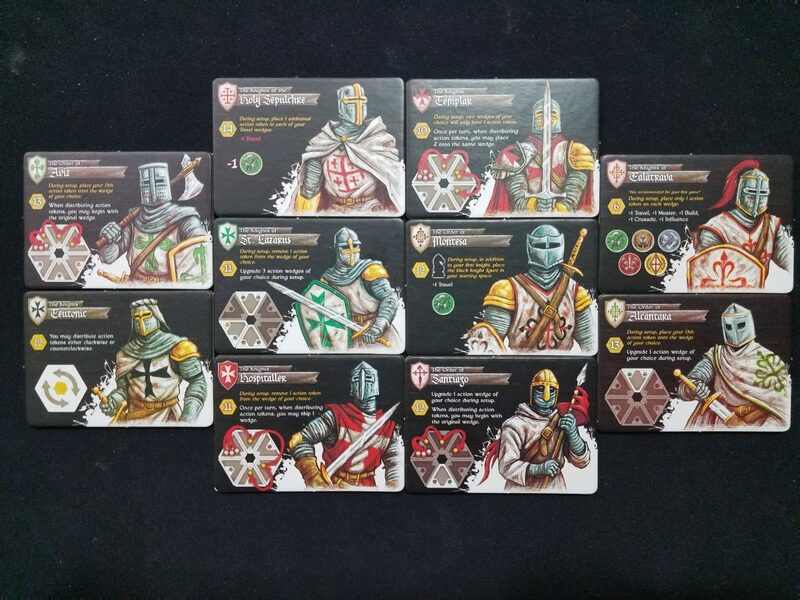 For instance, if you want to crusade against the Slavs and they’re at strength four, you’re going to need at least four tokens in that action space to be successful. Of course every action can be boosted in some way by investing in army strength or buildings. Nearly every action will give you some points, making Crusaders a point-floor game through and through. But it manages to ignore many of the flaws of that style of game by making everything so transparent and straightforward. A more obtuse game may make players feel like they’re going through the motions until the end where a winner is chosen through a series of unknowable calculations. During a game of Crusaders you will be keenly aware of when someone is starting to pull ahead in their point-scoring potential. It’s a race where the tension is predicated on marginal differences in efficiency between one player and another. Like a footrace there aren’t many chances to interact with the other players. You’ll be looking down at your own player board most of the game, only noticing everyone else at the table when they jump in front of you to take that building space you were eyeing. There’s some potential to actively try to stymie someone in this way, though I’ve found that even if someone does block my path there’s usually a straightforward alternative. Not that I mind staring at my player board very much because Crusaders looks fantastic. The color pallete is beautiful, the wooden pieces are chunky, and the cardboard is extra thick. I don’t think my past self could have ever predicted that thick cardboard would now be one of my favorite aesthetic pleasures, but here we are. 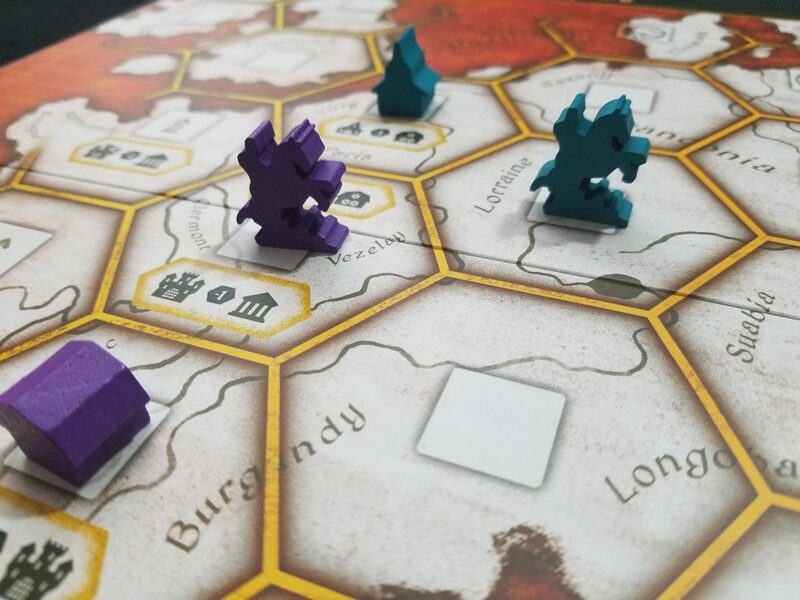 The visual design of Crusaders is clean, efficient, and attractive–a top notch production from TMG. The visual cleanliness is echoed in the design, which gives the players simple but effective actions. The gameplay loops are no more than two or three steps; you might build a building to give you more “muster”, which allows you to strengthen your army for easier conquests. One of the actions just hands over some points a la carte. While I love Eurogames that present to me a complex web of interactions, Crusaders’ simple approach is a refreshing change of pace. That tension between the straightforward path and a more complex chain of predicating actions is the best part of Crusaders. You could get lost in the rondel puzzle endlessly planning ways to squeeze the most benefit out of each action. I love starting a new game, looking at whatever player power I was given, planning an elaborate sequence of moves in pursuit of a new strategy. That player-game engagement is great, though it can’t quite sustain the entire experience. 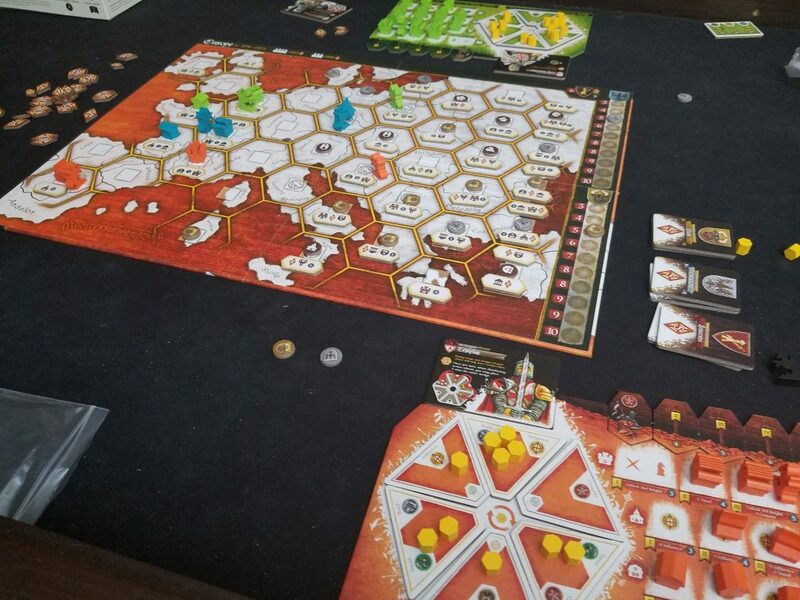 The end of a game of Crusaders is quite anticlimactic, with someone gobbling up the last of a pile of victory points while everyone wishes they had a bit more time to do cool things. The narrative arc of the game is quite flat, with your last few actions largely feeling the same as your first few, just with slightly larger numbers. You do get more powerful and more efficient, but that progression feels muted compared to other efficiency-focused 45-60 minute Euros.